Ever saw your co-workers taking another coffee break while you’re still having the same amount of work as in the morning and your shift is about to get over in an hour. Either they don’t have any work, or they’re effective at getting their job done. And there’s a higher probability for later to be true. Some people manage to get their work done effectively through the day, while some start cramming only after 4 pm. And if you’re reading this, I believe you’re a crammer. A Crammer – Someone who’s trapped in a black hole singularity on most days and works 8 hours straight without the blink of an eye a day before deadlines. But unfortunately, sometimes even that’s not enough to meet them. So how to work to never miss a deadline or have to spend extra hours at work trying to achieve them? The key is persistence, of course. And some pro tips that will help you do more in less time. Just as you need a map to reach somewhere, you need a map to achieve that “0 pending tasks status”. Make a to-do list and treat it as your map to get things done. Strictly stick to the list and don’t add too many tasks that you practically can’t finish by the day. We’re trying to be productive not setting a world record here, so go easy with your list. Try to write tasks down instead of using a digital medium; studies suggest writing down tasks increases the probability of getting them done. If you plan to get the work done early, you’ll have to start accordingly as well. Most organizations are flexible with their timings, which has some downsides as well. Like how your check-in time moved from 10:08 am to 10:45 am over time. And that’s how you’re losing your day. Starting early in the morning will get you done more by the time your colleagues will show up and start checking their email. For most people, mornings are the most productive time of the day, because after lunch they’ll be struggling to stay awake, gulping down cups of coffee one after another. 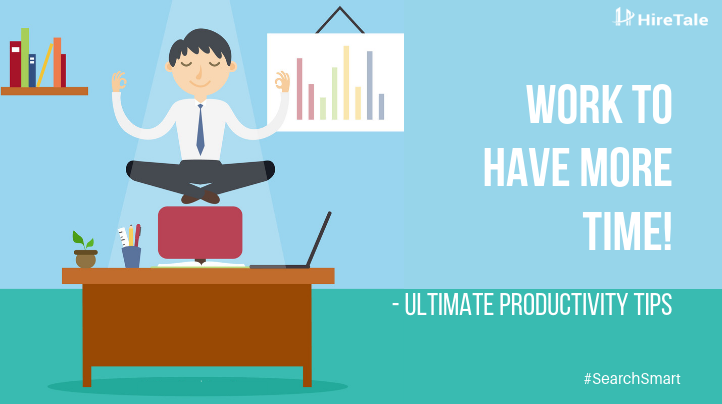 In case you’re wondering how working out will help you increase productivity? Exercising for sure has more benefits than just keeping you in shape. Working-out regularly will increase your energy levels and mental alertness. Will also boost your mood, and what else do you need to kick-start your day with? If multitasking was a skill on your resume, you know it’s time to let it go. Trying to get multiple things done at the same time will only get you low productivity and work that may err. Because it takes some time for our brain to transition from one activity to another, so working on multiple tasks together will not only demand more time but can also be prone to errors. Instead, try to pipeline your tasks. Focus on one task at a time, close all other tabs in your PC, and don’t even think about them. You have one task in front of you that you need to get done, that’s it. How you prioritize is a significant determiner of how productive you stay throughout the day. Stating the obvious, prioritize tasks based on their deadlines and how crucial they are. But also prioritize according to the complexity of the job. Complete the most difficult tasks early in the morning, when you have enough energy and mental capacities to allocate to that task. Sometimes some tasks look so onerous, that it takes enough motivation merely to get started with them. In order to stop procrastinating you can break down a task in some smaller tasks to get started. Like I need long uninterrupted sittings to write a blog, and that makes me procrastinate writing until I’m hitting a deadline. So I break writing into multiple tasks like researching, writing the first draft, optimizing, proofreading, etc. So my brain won’t treat it as one long task. Someone once said to me you can only perfect something up to 80% after that you’re wasting time and resources. I somewhat agree with that for a one-time effort, don’t get caught up into unnecessary details. Try to get the work done first then show your finesse if you want to, but don’t sit at square one trying to build a masterpiece that no one might notice. Though you may or may not get appreciated for displayed expertise, but for sure will get bashed by your manager for not getting the work done. Take an example of brushing your teeth every morning or driving through the familiar route to your office every day. Ever wonder how these tasks are so effortless they barely require any unusual attention. You can do so with the mundane or regular tasks of the day, and you’ll achieve more efficiency over time. That’s because our routine tasks are performed subconsciously and require a bare minimum amount of effort. It’s no wonder that mobile phones are counterproductive. It all starts with a post your friend shared with you on Instagram and now it has been around 2 hours and 35 minutes since you’re browsing the explore section. Don’t get caught up in that loop; you never realize how you waste countless hours a day scrolling through social media. Or sometimes you’re trying to focus on something crucial; your phone beeps, and it’s all lost in that moment. Especially, if you’re trying to stay productive, keep that phone on silent mode, turn off the vibration, and focus on work. That is what being productive is; you can get a task done in 8 hours or 8 days you decide. Set realistic deadlines for the task, let’s say you’ve three emails to reply to based on the type or cruciality, you can allocate like 15-20 minutes to respond to emails. Things can always be better; you can rephrase that line 500 times but time is running. Keep track of time as well. Phasing from task to task demands energy, it takes our brain a while to focus on a new task. So try to group similar tasks, instead of going from task to task. It will save you the time your brain would take to adjust. I wonder if you can relate to the situation when you’re trying to focus on your work and a group of chatty co-workers tries to host a long session of “Koffee with Karan” near your desk. It happens especially when I’m involved in a creative process that I would even yell at every passing car in the street for having engines. In situations like these, use a distraction to distract you! As per an experiment by Harvard business review, putting on headphones while working increases your productivity considerably. It may not work for some people, but if it does work for you, leverage this tool. Everyone knows that most of the meetings are futile and counterproductive. So try to avoid having any meetings in the morning if possible as it’s hard to keep them short and to the point. Don’t exhaust yourself trying to stay productive. Even if your hands don’t get exhausted, your brain does. So take a break once in a while and reward yourself, you’ve done an excellent job. There’s limited time, and your work is pretty finite as well, at least for a day. Thus work efficiently, to get all the work done and still have time for the things you love. Recommended, Workplace Tips Productivity, Tips. permalink.